Special Notes: Please read the following before ordering!! Or, call us first if there's anything you don't understand. Once these parts are gone, they are gone forever. We have only 6 sets of 1 Oblong Roller, with 1 Insert remaining. They are all Brown. They are $39.95 for the set of 2 items. We have about 50 or 60 Oblong rollers remaining, BUT! These are Brown or White. These rollers were made throughout the years by Big Tree. They changed the sizes slightly during the 10 or 15 years that they were made. 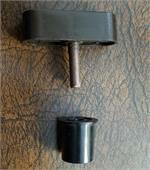 So, The shafts on these oblong rollers, may be slightly larger, and not fit your nylon insert. You have a few options. #1 Don't buy the Oblong Roller, #2 Buy them, but if the shaft doesn't fit, sand the shaft down, with a belt sander, or some other method, and keep cooling it with water, so you don't melt the plastic. #3, Using a drill that's slightly larger than the hole in your plastic insert, ream out the hole slightly, so that the shaft fits. #4 Another option is to made something that will work. Look at one of the pictures below. It's a piece of hardwood that someone cut, and trimmed the edges of, and drilled a hole, then put a hollow metal shaft inside the wooden piece to make it work. I'm sure you can also come up with a way to make the plastic insert too. One idea is to use a wood filler and fill the hole where the insert goes, and then drill a hole to the size of the oblong roller shaft. I hope that helps you. 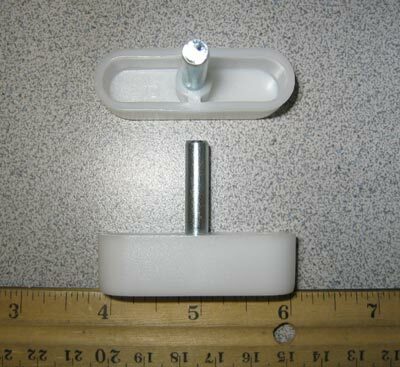 Oblong Roller (Each) Also known as Plastic Futon Glides, dowel runners, carriage blocks, Futon Rollers or Oblong Glides. These attach to the sides of the Back part of the frame with the attached pin, and when assembling the frame, the Rollers slide into a groove in the arms and allow the futon frame to convert from a sofa to a bed and back. Sometimes the pin goes into a plastic insert which is sold separately. Make sure to check to see if the Plastic Inserts on your frame are in good shape. If they are cracked, you'll need to order some of those too. See Related Item below. These Do Not Fit Norka futon frames.